Here is a slide show of photos taken on site by Steve Kolbe, Derby Hill Bird Observatory Hawk Counter, in the Spring of 2013. Many other birds besides raptors migrate over Derby Hill. In early March, small flocks of Horned Larks are an almost daily occurrence, and later in the month many thousands of Snow Geese can be seen. Blackbird flocks start showing up in March, with adult male Red-winged Blackbirds in the vanguard of the migratory movement. Later in the season, the composition of these flocks changes as females and immatures are mixed in, as well as Brown-headed Cowbirds and Common Grackles. These birds migrate around sunrise and sunset. That American Crows migrate too, will be obvious to anyone who visits Derby Hill around the passage of a warm front in early / mid-March. A steady stream of thousands of crows fills the air around this time. Chickadee, Tufted Titmouse, Northern Cardinal, White-breasted Nuthatch, Red-winged Blackbird, Common Grackle, Brown-headed Cowbird, Blue Jay, Dark-eyed Junco, House Sparrow, European Starling, American Goldfinch, Rose-breasted Grosbeak. Some woodpeckers, such as Pileated, Red-bellied, Downy and Hairy Woodpeckers, can be seen year-round. Others, like Red-headed Woodpecker, Northern Flicker and Yellow-bellied Sapsucker, are usually seen in migration only. On some days early May, the flicker flight can be quite impressive, with literally hundreds of them moving through in a matter of hours. Yellow-rumped (‘Myrtle’), Cerulean (rare), Prairie (rare), Palm, Black-throated Green, Bay-breasted, Blackpoll, Yellow-throated (rare), Black-and-White, Blue-winged, Golden-winged, Tennessee, Nashville, Worm-eating, Wilson and Canada Warblers. Also seen at Derby are American Redstart, Northern Parula, Ovenbird, both Waterthrushes, and Common Yellowthroat. In addition to these warblers, Gray Catbirds, Brown Thrashers, both kinglets, Baltimore Orioles, Rose-breasted Grosbeaks, Scarlet Tanagers and Cedar Waxwings can all be abundant on the hill at times in spring. Late in the season, Derby Hill is a great place to hone your swallow ID-skills. 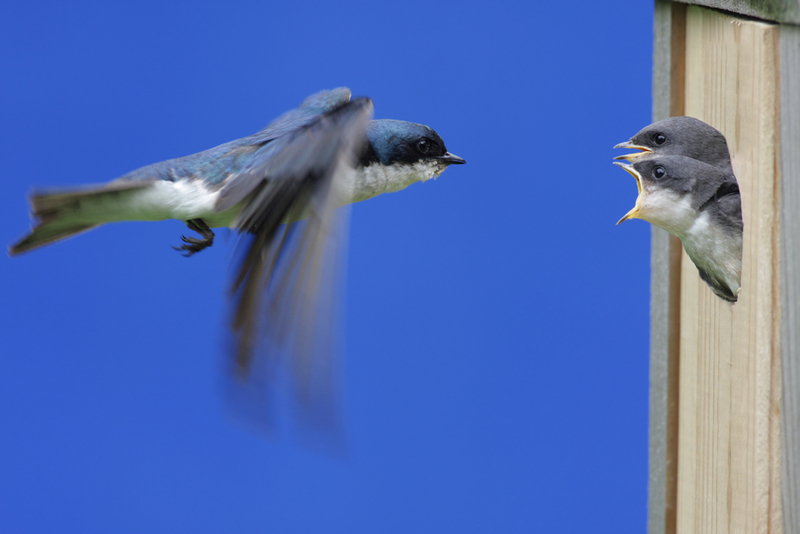 Some days in May, all swallows that occur in New York State can be seen swirling together: Purple Martins, which breed on the property, as well as Tree, Northern Rough-winged, Bank, Barn and Cliff Swallows are in the air then. In fall, Derby is one of the best places in the Northeast to see Cave Swallow, a Southern rarity. Derby Hill Bird Observatory is also the site of a unique project for acoustic monitoring of avian flight calls. Massive migrations of birds occur at night across much of the Americas. Many species give short vocalizations as they fly, presumably for echolocation, to maintain contact with other migrating birds, and to work out flight spacing to avoid mid-air collisions. Thousands of calls a night can be heard in some locations. Much of this migration is well above the average altitude of the terrain and not easily heard by ear, but a microphone can help tune in and amplify flight calls of migrating birds. This monitoring is being done to document the number of calls and species of birds flying over a specific location. The installation at Derby Hill is part of a regional network of recording stations that is helping produce a bigger picture of bird migration patterns. Long term monitoring of migration is a conservation tool that provides an additional record of changes in bird populations. Monitoring at Derby Hill which started in the Spring of 2012 is already showing remarkable numbers of birds migrating at the east end of Lake Ontario. The plan is to have the monitoring station active Spring through Fall. Spring is the time for observing hawk migration over Derby Hill, but hawks are not the only specialty at Derby Hill. Late fall lake watches from the bluffs at Derby Hill can provide exciting coastal birding, with several species commonly seen only from coastal sites. All three jaegers, as well as both white-winged gulls and kittiwakes are seen every fall at Derby. Strong northwest winds are best for lake watching, as they tend to blow birds into the southeast corner of the lake, right on Derby’s doorstep. The fall 2006 lake watch at Derby Hill gave Region 5 two new records: Manx Shearwater and the region’s first Razorbill. On the preferred northwest winds, you expect good gull flights. Little Gulls have made a number of appearances, and Sabine’s Gull can also be seen. A Black-headed Gull was also sighted on one occasion. Pomarine and Parasitic Jaegers, as well as Black-legged Kittiwakes can be expected, as are all three scoter species. Keep a look out for Harlequin Duck, and a King Eider. Other highlights in the past have included fly-by flocks of Whimbrel and Hudsonian Godwit, two of the area’s toughest-to-find regular shorebird migrants.